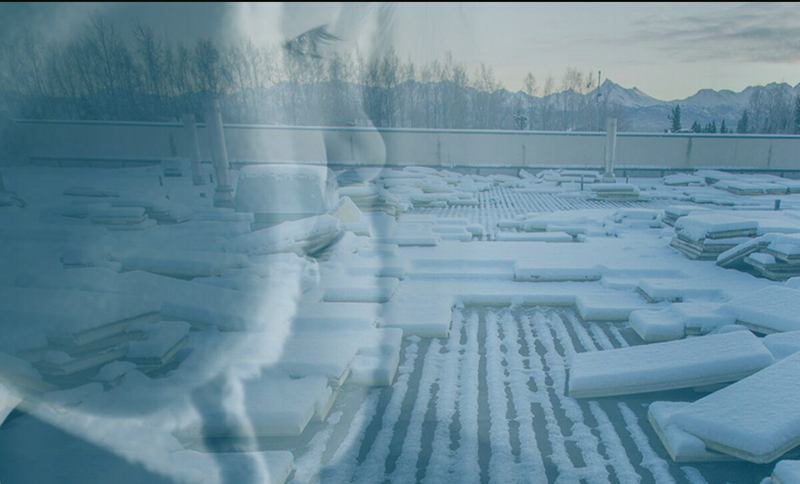 SPONSORED: With 6 million square feet of roofing on 92 facilities, keeping Anchorage School District students warm, dry, and safe all winter long is a complex and difficult job. SPONSORED: In a city like Anchorage, the winter climate can play havoc with your roof over time. The freeze/thaw cycle alone can lead to occasional issues that require maintenance and sometimes complete replacing, especially when your roof arrives at the end of its 25-year lifespan. When the roof on your house needs replacing, it might seem like a pretty big job. You'll need to hire a roofing specialist, make sure you have a plan and time to complete the work, and find a way to afford it. Now imagine you're responsible for taking care of the roofs — and every other component — of all of the buildings in the Anchorage School District, which stretches from Mirror Lake to Girdwood. "We have over 7.8 million square feet of facilities, about 6 million square feet of roofs," said Tom Fenoseff, ASD's senior director for capital planning and construction. That's the square footage equivalent of more than 137 acres or 104 football fields. "So it's a daunting task to maintain these roofs over the lifetime of the roof." Maintenance and operations for the district is a complex system of maintenance and repair that includes, for example, 32,000 locked doors, according to Director of Operations Darin Hargraves. "We've got hundreds of boilers," he said. "We have hundreds of hot water heaters, we have a large set of facilities that we maintain … (the scope of the job) is a component of the complexity (that) we have to deal with." ASD has the single largest footprint of facilities to maintain in Alaska. More importantly, the district has 47,700 students and 6,000 employees to consider. "In Anchorage, if you look at about 300,000 people that live here, one-sixth of (everyone) presently residing in Anchorage will go through our doors 180 days of the school year," Hargraves said. That's one-sixth of the entire municipality under the care of the school district for three-fourths of every year. The schools were all designed and built for the Anchorage climate. "The challenge that we have is that we have inclement weather that breaks down facilities," Hargraves said. "Anytime you have ice that freezes, expands, and contracts, it loosens things up." Although the materials used are all designed to withstand that cycle, he said, there's the cost of cleaning, labor, maintenance, and wear and tear on the equipment. The expected lifespan per school roof is about 25 years, the same as for residential buildings. It's not just roofs, though, said Deena Bishop, Anchorage School District superintendent. "The majority of our buildings are from the '50s, '60s, and '70s," she said. "They're coming of age." From HVAC systems to roofs to flooring, "we're pretty much here doing the bare minimum to hold the buildings together," Bishop said. There's a big difference between maintaining your home and taking care of school buildings, of course, starting with building material. Unlike the asphalt shingle roof you'll find on many Anchorage-area homes, most ASD schools have a flat "IRMA" roof, shorthand for "inverted roof membrane assembly," according to Fenoseff. IRMA roofs, which have a surface layer of exposed pavers, are expensive to maintain in Anchorage, and the district is hoping to replace them with polyurethane-topped roofing, he said. There are other systems that are showing age, too. "We have old technology in some of our buildings," Hargraves said. "We have nomadic controls in our ventilation system in our older buildings, and these things have to get adjusted. We had a case, for example, where an actuator came out of adjustment on a nomadic system where the air comes in. The louvers weren't shutting all the way and the cold air got in tracked into the building about 30 feet and froze some of our plumbing." Roofs, though, are the first line of defense against the elements. And there are some in the district right now that already leak through to classrooms, according to Bishop. "We presently put buckets and deal with classrooms that have leaks," she said. "These roofs definitely need to be redone." Leaks aren't just a problem in the spring and fall, she added. They're a concern in the winter, too. "When we get a few warm days, it'll put water right back into our classrooms," Bishop said. The district may be able to add a few more years to the lifespans of other roofs through upgrades. "We're looking to impact some with a different drainage system so that we can tack on another 10 to 20 years onto these buildings," Bishop said, "so that we won't have to replace them sooner than that." A warm and welcoming learning environment is a must for student safety — and maintenance issues can quickly become impediments to learning. Earlier this year, Susitna Elementary School's boiler went out, causing a flood, and school had to be canceled. "It can be as drastic as that, where we had to cancel a school day," Bishop said. Think of the school district as a company, she added. "If our city owns this company," she said, "and it wants the company to be as successful as it can be — and continue to bring value into the future — you would continue to invest in something that is bringing you value. And I would say that the Anchorage School District and its mission brings value to the city of Anchorage." This article was produced by the creative services department of the Anchorage Daily News in collaboration with the Anchorage School District. The ADN newsroom was not involved in its production. © 2019 Alaska Dispatch Publishing. All rights reserved.